The Remington ThunderJet is a great new arrival from Remington in the USA. 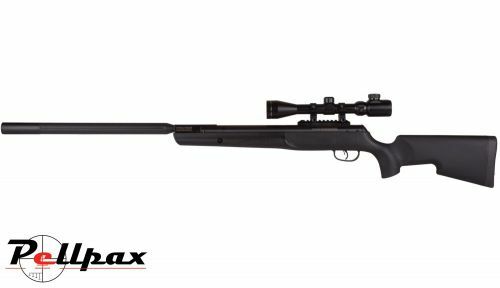 This air rifle model features a powerful Gas Ram system at its heart to provide consistent and accurate power. The sculptured synthetic polymer stock is both comfortable, and well balanced to ensure a great shooting experience. The barrel is sleeved with a built in baffle design to reduce the muzzle report considerably, making it ideal for hunting and target shooting, whilst maintaining accuracy. A two stage trigger is also fitted to customize the rifle to the individual shooter. Included as well with the air rifle is a 3-9x40 IR scope and mounts.